Protecting an enterprise is a complex, multifaceted challenge that has traditionally been approached in stovepipes. The majority of organizations treat business continuity and disaster recovery preparedness planning activities independently and separately from cyber threat and associated information security activities. Furthermore, protection and sustainment activities, for both, are planned for and dealt with, without much collaboration with other critical contingencies that enterprises must plan and execute in order to protect their critical business operations. Those other activities could include both traditional (e.g., Environmental, Health, and Safety – ESH) and emerging (e.g., Privacy protection) protection and sustainment efforts. Recently there has been growing interest from both government and commercial entities in considering a more integrated approach to protecting their enterprises. 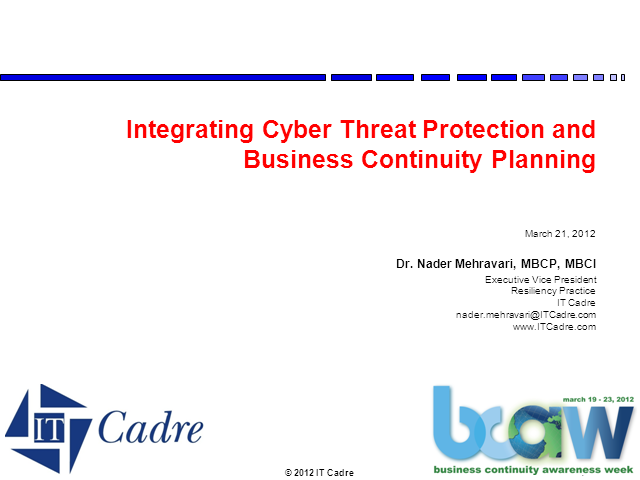 The goal of this presentation is to consider such integration efforts, and in particular, approaches enabling integration of cyber threat protection and business continuing planning.